Instrument Repair Classes Starting Now! After several years of trying to explain on paper what it is that I do all day, I finally came to the conclusion that I could get my point across a lot better if I could actually show people how I do it. Pictures with captions can only take you so far, So the next step is to try to see if there is a demand for this. Everyone is always saying to me, "I would love to know how you do that"! Well now is your chance . Starting in March, I am putting together a series of "Repair Classes" that I feel can be easily learned ( with a little determination) by anyone with even limited skills. Half of the battle is knowing how to do something, After you add a little practice (and maybe a little more practice) you might find that "Hey! That isn't so hard after all". There are lot of different "building schools" and "repair schools" out there, but I have found them to be very expensive and sometimes a little more than some people might want to commit to. The classes I will offer are catered to the person who may be interested in learning how to do a certain repair, or fix a certain issue with their instrument but does not necessarily want to "buy the whole cow". Classes will be short in length (2 to 6 hrs) So that your "spare" time can be easily managed and most importantly, They will be affordable. I have also decided that by keeping the classes small (only 3 students per class) it will ensure that everyone will get my undivided attention . So if your goal is to learn something new this coming year, this could be the perfect opportunity to sign up soon soon. These classes are divided into 2 sessions, each lasting 1+ hrs. (Usually held during the week in the evening) They are designed to familiarize the student with the daily tasks, challenges and tools that are used in a instrument repair shop. You will learn the art of making a new well fitted “nut” from natural bone material . The first choice in high end guitar manufacturing and the choice of Liam Guitars. Other materials will also be addressed.A properly fitted nut is the “bread & butter” of the repair business. In my opinion a proper setup cannot be performed without this invaluable technique . Students will learn the proper methods to eliminate pesky fret buzzes. “Level” and “crown” frets so they feel and play like “butta”. 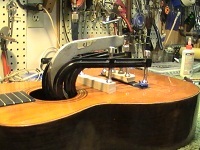 You will learn the correct methods of removing and replacing individual frets. A well dressed fret job is essential to the discerning guitar player.